The whiskers were my own idea -- the ends of the thread used to sew on the eyes. 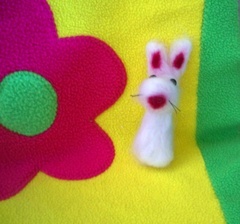 Needle-felting = quick + fun! But this is my only work in this medium to date, though naturally I bought lots more roving than I needed. Many thanks to Molly and Sue for leaving comments the other day -- and to anyone else who returned to this almost-orphaned blog after yet another interminable stretch between posts!! It's "Scamp" from Pipsqueaks by Kim Hargreaves, and I used Handknit Cotton. Perhaps I should rename my version Scampette or Scampina, though, because the pattern as written produces a sweater, not a vest. I tried diligently to knit the sleeves, I really did, but I was having a ton of trouble incorporating in the increases properly. I got reasonably far along on my second attempt before giving it up as a bad job. So, a vest it is and shall remain. But I love the fabric that Handknit Cotton creates, and I enjoy looking at the front and the back and realizing that, years ago though it may have been, I actually followed this kind of chart. Once. A word to the wise: I knit the smallest size on offer for this particular pattern in the book, for ages 1-2, and it will fit 2 1/2 year old Ellie at least until winter. I think the measurements match the schematic in the book, but I can't find my tape measure at the moment. 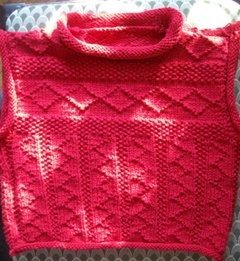 In any case, it was certainly too big to knit for an infant, which was the original plan back when Hector was a pup. I doubt I will ever use crochet for anything other than these super-sweet little toys, finger puppets, etc. (Famous last words, but I just don't see crocheted garments in my future. Not that there's anything wrong with people who do!!!) But I could not continue life without amigurumi once I had a look at the Etsy store of the designer who put up the free patterns above. 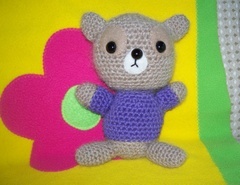 And there are a number of really cute free and for-sale patterns elsewhere on the Net, of course. You know what they say about the zeal of the convert! Wait till you see my needle-felted bunny. My next post, however, will be on the knit sweater vest for Ellie that began life more than 4 years ago for another child and is finally finished. Kim Hargreaves in Pipsqueaks, you rule! The post will appear in fewer than 4 years.